She's Thriving is a space designed for the wellness seeking individual in their quest to be thriving in their personal life, professional life, and communities. Tune in every week as we chat with guests, share authentic stories, and inspire one another to learn and grow. This week we come to you literally live from the closet! We wanted to chat in depth about the goal setting workshop we are hosting on Monday April 29th at Saje Wellness in San Francisco. So we turned the microphone AND the camera on ourselves this week (check out the @shesthriving Instagram for the full video and a look into the infamous closet) to get real about our own personal relationships with goal setting and the experience we are looking to create through our Living with Intention workshop. Be sure to grab your tickets to the event ASAP. We are so excited for an evening of intention to check in with ourselves and feel aligned and excited about the life we are creating. Molli and MK are pretty sure they have found a pair of entrepreneurial fairy godmothers in Tal Winter and Kate Cutler, founders of bkr, the water bottle phenoms that are becoming your one-stop-shop for all things hydration. Close friends since law school, Tal and Kate found themselves feeling disenchanted by their successful law careers and decided to boldly embark on building a product they believed in for a customer they cared deeply about. Listen as they give us an invaluable crash course in what it's like to start a company, the challenges that come from doing so as a woman, the value of finding a cofounder who compliments your skills, and the perseverance it required to stay in alignment with your vision. We are in for a treat for this week’s coffee chat. We had a very special visitor to the closet - MK’s mom Moey! In addition to being a number one fan of the podcast, Moey is a constant source of love and support and hilarity in our lives and we loved having her brief but wonderful commentary. Molli also makes some literary confessions as we break down the stories we are told and taught; and our responsibility in noticing the missing voices. We recently sat down with Molly Bellar, Creative Director of Stella & Dot, to hear how she has consistently carved out a career that utilizes her talents and passions in a fulfilling way. The role of Creative Director isn’t necessarily one you can study for with an undergraduate degree, but Molly has been able to leverage her gifts to work cross-functionally with teams throughout her career and build her dream roles in a variety of companies. She also made the bold decision, in the middle of her professional success, to take a dream trip with her husband and two children, pausing the hustle and bustle of their lives to travel all over the world for 6 months. I repeat, she traveled to multiple foreign countries with 2 children under the age of 6, for 6 months. And still calls it one of the best decisions she’s ever made. We hope Molly's story helps remind you of your power to design the life that helps you THRIVE! So wait, who exactly is thriving? This week we wanted to breakdown who we are talking about when we refer to "she" (hint, it's us!) But the community and space we are trying to build here at She's Thriving HQ is an inclusive one. So we wanted to take a moment to make it clear that the thriving is for EVERYONE! Today we hear from Kenna Kryger as she shares her personal journey of sobriety. She openly and vulnerably discusses the pain and loneliness of her addiction, along with the hard work required to heal. We were moved to hear how much love and compassion she has for both the woman she was and the woman she has grown to be. She has created a life she loves filled with community and support, all while helping others along in their journeys toward healing as well. She is so generous with her spirit and wisdom; we hope you find as much inspiration in her story as we did. Coffee Chat - Share What's Good! MK & Molli sit down to discuss the merits of some casual lady bragging. It's time to heal any conditioning we've received that convinced us we weren't allowed to be big and loud about how amazing we are. Sharing our accomplishments, our moments we're proud of, our joy and excitement is all a part of self-love, so no more hiding it! We want you shouting it from the rooftops with a megaphone! Let us know what you are excited about in your life right now so we can get inspired and excited too! Kamelle Mills is a force of joy and love in this world, and he recently sat down with us to discuss the new way he plans to harness all of the positivity and creativity he has cultivated over the years. In addition to being a Senior SoulCycle Instructor based in the Bay Area, Kamelle has finally honed in on another cause that has been calling to him for quite some time. He is mere days away from the kick off event launching his new nonprofit, PROFOUNDations. In this weeks episode, Kamelle opens up about the people and experiences in his own life that had a profound impact in shaping him to be the phenomenal, authentic leader he is today. And he shares his dreams for making such profound experiences accessible to the community of LGBTQ youth of color that PROFOUNDations will serve. Spring has sprung y'all! And whooooh we are feeling IT. There's a new season, a new moon, and lots of new and exciting things happening in our lives. And with all this newness, comes new tension and new stress that so often accompanies growth. So we decided to take a breath to check in with ourselves and each other and open up about how we've been feeling and what we've been doing to take care of ourselves. What are you doing these days to check in with yourself? How are you feeling in this new season? Let us know! Also, here is a link to the Almost 30 episode we refer to, featuring Ruthie Lindsey! Charlotte Macaulay didn't always know she wanted to be a fashion designer, but once she knew, she enthusiastically and joyfully hustled for her dream, and the synchronicity that ensued will give you goosebumps! Check out this week's episode to hear how she originally encountered her creative calling. And get inspired by how she transformed that calling into a career and her current role as VP of Design at Stella & Dot. Charlotte also opens up about her experience navigating promotions and pregnancy, and gets real with us about how she maintains her sense of self in her approach to motherhood. Inspired by our recent conversation with Jenny Gaither, founder of Movemeant Foundation and Boss Babe Blueprint, we wanted to have our own open and honest conversation about our relationships to our bodies and food. Warning - we discuss our experiences with diet culture and disordered eating and our paths to healing in this episode. If you are struggling with any of these issues around food or body image, visit Project HEAL for additional support and resources. We love you so much and we hope you send yourself some love today too. We are so excited to bring you this inspiring and vulnerable conversation with one of our dearest friends and mentors, the incomparable Ms. Jenny Gaither. In addition to being a Master Instructor at SoulCycle, Jenny is the Founder and CEO of Movemeant Foundation, a non-profit that uses fitness as a tool to help girls and women build self-worth and confidence. In this new year, she is expanding her work to empower women through the launch of her Brave Babe Blueprint health coaching service. She opens up about how she had to get real about her motivations, how that has changed the way she approaches social media, and what we all can be doing to be building a better future. You can find out more information on her coaching and Movemeant events, like Dare to Bare, on her website: https://www.jennygaither.com/. Rest is self-care. Rest is self-care. Rest is self-care! It's a phrase we find repeating to ourselves often, and this week we discussed the specific strategies we use to ensure we are getting the proper rest and reset that we need. We also chat about our struggles with shame and guilt around rest, and the internal work we've done to heal those stories. Get in that bath and give this episode a listen! This week we had the chance to chat with our podcast inspiration and creative fairy godmother, Lindsey Simcik. 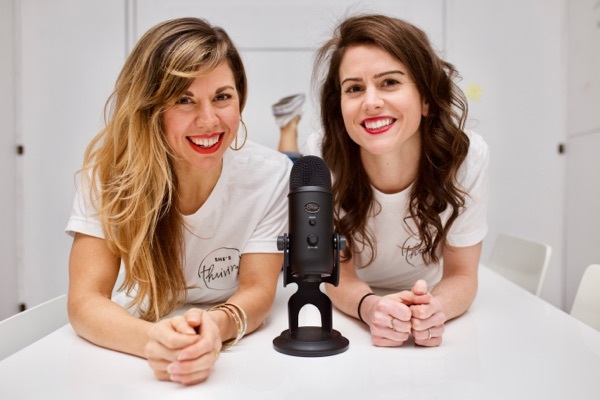 Lindsey and her cofounder, Krysta Williams, are the hosts and creators of the Almost 30 podcast - a podcast that brings listeners honest conversations about topics like wellness, entrepreneurship, spirituality and self-development. In addition to starting a popular podcast and building an incredible community of listeners, Lindsey opens up about how she honors her identity as a creator and how her management of her own wellness and self-care has evolved since Almost 30's inception. And for anyone who has been thinking about starting their own podcast but hasn't known where to start, Lindsey and Krysta have also made their expertise available to the masses through Podcast Pro. Check it out for invaluable resources and guidance and tap into the wisdom of these fairy godmothers for yourself! Molli and MK go to the theater! Specifically we went to see Hamilton on Sunday and walked out feeling inspired by the juggernaut of creative genius. So we sat down for this week's Coffee Chat to discuss the importance of tapping into what Elizabeth Gilbert describes as the big magic of creativity that exists in all of us. This week we hear from Molli Sullivan and learn a lot more about this dynamic woman, beyond just her well-documented love for salads and SoulCycle. Molli courageously keeps it one hundred percent real as she discusses the joyful times right alongside the darker moments, and in doing so, she invites all of us to let go of shame, for good. This week, we chat about our mutual intimidation at first sight, how grateful we are that we didn't let our insecurities keep us from such an incredible friendship, and how the power we all possess to make each other feel seen is the greatest power of all. Allow us to introduce ourselves! This week, we get to know MK a little better as she shares her journey from finance to fitness; why she places such a huge value on showing up for one another; and what thriving looks like for her. Coffee Chat - Just Start! In our very first episode, we are so excited to bring you a live recording of our launch event - She's Thriving: What Wellness Really Looks Like for Women in 2019 & Beyond. This panel event was held in San Francisco, CA at The Wing on Saturday February 2, 2019. Our amazing panelists included SoulCycle Instructor and She's Thriving co-founder, Molli Sullivan (@molli.sullivan); licensed psychotherapist supporting ambitious women in navigating life transitions with authenticity, grace and vitality and co-founder the SF based holistic group practice HAVN, Kat Dahlen (@therapywithkat); co-founder of Seldom Seen, a San Franciscan run boutique that brings a unique and inclusive approach to fashion centered on an experience that begins with community, Natasha Wong (natasha.k.wong); and founder of NDN and co-founder of Sitting Matters, a wellness and lifestyle expert combining her backgrounds in neuroscience, dance, nutrition and fashion to create a mindful and creative space for group and individual consulting, coaching and content creation, Nkechi Njaka (@ndnlifestylist). The panel was moderated by Senior SoulCycle Instructor and She's Thriving co-founder, MK Hurlbutt (@mkhurlbutt). We would like to send a special thanks to all of our AMAZING partners who made the event possible: SoulCycle, The Wing, bkr, Curie natural deodorant, Drunk Elephant, Urban Remedy, SF Salt Company, La Casa de las Madres, Praise Photography, Farmgirl Flowers, Apres, and Lululemon. Use code WING20 for 20% off orders from Apres and code ShesThriving15 for 15% off orders from Farmgirl Flowers. Bringing you new episodes every Monday and Thursday. Subscribe now!